Public Health In-vitro Diagnostic Control Laboratory, Medical Laboratory Science Council of Nigeria, Yaba-Lagos, Nigeria. Department of Histopathology, Usmanu Danfodiyo University Teaching Hospital, Sokoto, Nigeria. N.K.S.T. Len Gabrielse’ School of Medical Laboratory Science Mkar, Benue State, Nigeria. Population Council, Nigeria, Yaba, Lagos State. Background: The study was to immunohistochemicallydetermine the Correlation of the Expression of Vitamin D Receptor (VDR) and Triple Positive Invasive Ductal Carcinoma (IDC) of Breast tissues. Materials and Method: Fifty six (56) archived female breast Invasive Ductal Carcinoma tissue blocks were experimented Immunohistochemically with ER, PR, HER-2 and VDR.Seven (7) confirmed cases of those that were positive to ER, PR, and HER-2 (Triple Positive) were correlated with VDR expressionand the results were compared. Result: The results show that there was no significant difference (P?0.05) found comparing the immunohistochemical expression of VDR with Triple positive IDC tissues. Conclusion: This study shows that no significant difference was found in the expression of VDR and triple positive IDC tissues; it can therefore be said that VDR can be of therapeutic target and of additional antibody in immunohistochemical diagnosis of breast cancer. 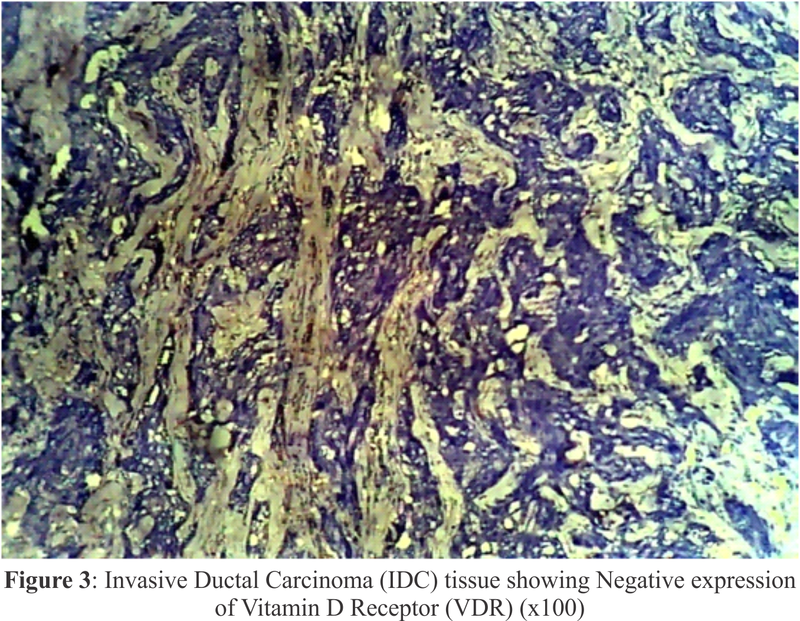 Keywords: Vitamin D receptor (VDR), Triple Positive, Breast cancer, Invasive ductal carcinoma (IDC). Breast cancer is the predominant malignancy where oncologists use predictive markers clinically to select treatment options, with steroid receptors having been used for many years. Immunohistochemistry has taken over as the major assay method used for assessing markers . The surfacing of molecular technology has brought about new biomarkers along with immunohistochemical and serum biomarkers. Immunohistochemical markers [Estrogen receptor (ER), Progesterone receptor (PR), and Human epidermal growth factor receptor 2 (HER-2)] are often included inguiding treatment decisions, to classify breast cancer into subtypes that are biologically distinct and behave differently, and both as prognostic and predictive factors. Invasive ductal carcinoma (IDC), also known as infiltrating ductal carcinoma, is cancer that began growing in the duct and has invaded the fatty tissue of the breast outside of the duct. The commonest type of breast cancer is IDC, which represent 80 percent of all breast cancer diagnoses . Breast cancer is the most frequent cancer among women, being a heterogeneous disease, with distinct morphologies, metastatic behaviour and therapeutic response . Approximately, 90% of breast cancer deaths are caused by local invasion and distant metastasis of tumor cells .According to , different types of this neoplasm exhibit variable histopathological and biological features, different clinical outcome and different response to systemic interventions. In fact, global gene-expression analyses have provided an appealing molecular classification for breast carcinomas, which is highly associated with patients’ prognosis .In the last decade; a major effort has been made to better inform the choice of the systemic treatment for breast cancer patients. Vitamin D receptor (VDR) can be called Calcitriol receptor, and is also known as NR1I1 (nuclear receptor subfamily 1, group I, member 1), is a member of the nuclear receptor family of transcription factors . Upon activation by vitamin D, the VDR forms a heterodimer with the retinoid-X receptor and binds to hormone response elements on DNA resulting in expression or transrepression of specific gene products. In addition to VDR regulation of transcriptional responses, it is also involved in microRNA-directed post transcriptional mechanisms . In humans, the vitamin D receptor is encoded by the VDR gene .Glucocorticoids are known to decrease expression of VDR, which is expressed in most tissues of the body and regulate intestinal transport of calcium, Iron and other minerals .Also, it has recently been identified that VDR as an additional bile acid receptor alongside FXR and may function to protect gut against the toxic and carcinogenic effects some endobiotics. Different researches have shown the evidence of linkage between vitamin D and breast cancer. Women who have breast cancer tend to have low levels of vitamin D in their body. Researchers have found how vitamin D might have a role in breast cancer. On the surface of a cell are also found Vitamin D receptors where they receive chemical signals. These chemical signals direct a cell to do something by attaching themselves to a receptor, for example to act in a certain way, or to divide or die. Vitamin D can bind to vitamin D receptors which are in breast tissue. These can oncogenes to die or stop growing, and can stop the cancer cells from spreading to other parts of the body. It is then said that vitamin D may help in preventing breast cancer, by making cells in the breast smarter. However, the relationship between breast cancer and vitamin D is complex, not fully understood, and is still being studied .A study carried out by  discovered VDR expression in patient of large population as inversely related with more aggressive breast cancer, but not with breast cancer survival outcomes. This research therefore, has set out to correlate the immunohistochemical expression of VDR with Triple Positive Breast IDC tissues. This study was carried out at Department of Histopathology, National Hospital Abuja, FCT, Nigeria. The Hospital serves most of the states of Nigeria and therefore serving a significant population of the region. Approval for this research work was obtained and given from the Health Research Ethics Committee (HREC) with assigned number NHA/EC/062/2015 of National Hospital Abuja, FCT, Nigeria. Fifty six (56) archived female breast Invasive Ductal Carcinoma tissue blocks were experimented. 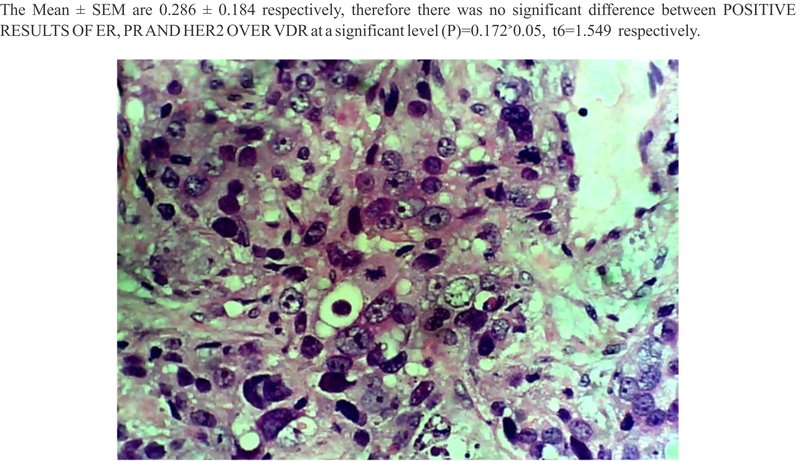 The Seven (7) cases that wereconfirmed triple positive Invasive ductal carcinoma tissues were then obtained for correlation with VDR expression. Paraffin tissue blocks diagnosed of invasive ductal carcinoma of the female breast were experimented and those positive to ER, PR, and HER-2 (Triple positive) of the female breast were selected. The tissue blocks were sectioned at not more than 2µm each. Seven (7) sections were obtained from each block from which one (1) section was used for Haematoxylin and Eosin staining technique while four(4) sectionswere treated with VDR, ER, PR and HER-2antibodies, while the other two (2) sections were used as negative and positive control. Eosin for 1minutes. They were then washed in tap water, dehydrated, cleared and mounted using DPX . The method used is the Avidin Biotin Complex (ABC) method and the antibodiesthat are used were Novocastramanufactured. The antibody dilution factor used was 1:100 dilutions for all the antibody markers. The processed tissues were sectioned at 2µm on the rotary microtome and placed on the hot plate at 700C for at least 1hour. Sections were brought down to water by passing them in 2 changes of Xylene, then 3 changes of descending grades of alcohol and finally to water. Antigen retrieval was performed on the sections by heating them on a Citric Acid solution of pH 6.0 using the Microwave at 1000C for 15minutes. The sections were equilibrated gradually with cool water to displace the hot Citric Acid for at least 5min. Peroxidase blocking was done on the sections by covering them with 3% hydrogen peroxide (H2O2) for 15min. Sections were washed with PBS and protein blocking was performed using avidin for 15min. Sections were washed with PBS and endogenous biotin in tissue was blocked using biotin for 15min. After washing with PBS, sections were then incubated with the respective diluted primary antibody, diluted 1:100 for 60 min. Excess antibodies were washed off with PBS and a secondary antibody (link) was applied on section for 15min. Sections were washed and the (label, in this case which is the Horseradish Peroxidase HRP) was applied on the sections for 15min. A working DAB solution is made up by mixing 1 drop (20µl) of the DAB chromogen to 1ml of the DAB substrate. This working solution was applied on sections after washing off the HRP with PBS for at least 5min. The brown reaction began to appear at this moment especially for a positive target. Excess DAB solution and precipitate were washed with water. Sections were counterstained with Haematoxylin solution for at least 2min and blued briefly. Sections were dehydrated in alcohol, cleared in Xylene and mounted in DPX . Cells with specific brown colours in the cytoplasm, cell membrane or nuclei depending on the antigenic sites were considered to be positive. The Haematoxylin stained cells without any form of brown colours were scored negative. Non specific binding/brown artifacts on cells and connective tissue were disregarded . Photomicrograph was basically used for correlating the expression and where necessary, Paired T-test statistics method was used to analyze the data generated. There is no significant difference found; comparing VDR expression with Triple positives Breast IDC tissues which indicate that VDR can be used as an additional antibody in the immunohistochemical diagnosis of Breast IDC. 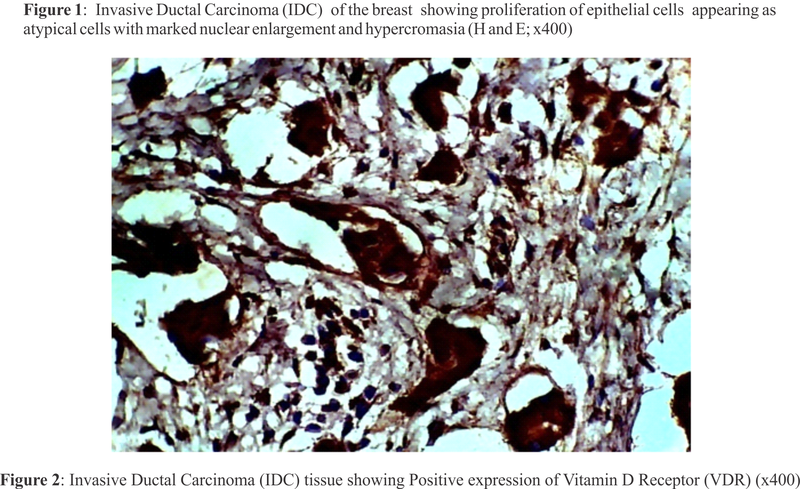 This result is supported by earlier related study done; VDR expression was analyzed immunohistochemically in breast cancer patients in whichstrong VDR immunoreactivity was observed in breast cancer specimens, supporting the body of evidence that breast cancer may be a target for therapeutically applied vitamin D analogues. This also support a study carried out that said; there are vitamin D receptors in breast tissue, and vitamin D can bind to these receptors. This can cause oncogenes to die or stop growing, and can stop the cancer cells from spreading to other parts of the body. Therefore, it is thought that vitamin D may help in protecting against breast cancer .This can also be related to the findings by  that VDR expression in patient of large population is inversely related with more aggressive breast cancer. On the basis of this study and relevant literatures review, VDR has statistically significant correlations when compared with Triple positives Breast IDC tissues; it can therefore be said that VDR can be of therapeutic target and of additional antibody in immunohistochemical diagnosis of breast cancer. Further research is recommended to fully ascertain this fact. 1. Walker R. A. (2007): Immunohistochemical markers as predictive tools for breast cancer Department of Cancer Studies & Molecular Medicine, University of Leicester, Robert Kilpatrick Building, Leicester Royal Infirmary, Journal of Clinical Pathology; 61:10.1136. (IDC); http://www.hopkinsmedic-ine.org/breast_center/breast_cancers_other_conditions/invasive_ductal_carcinoma.html . Sited November, 2016. 3. Ricardo, S., Vieira.,A.F.,Gerhard, R.,Leitão, D.,Pinto, R., Cameselle-Teijeiro, J, F., Milanezi, F., Schmitt, F., Paredes, J (2011): Breast cancer stem cell markers CD44, CD24 & ALDH: expression distinguishing intrinsic molecular subtype: Journal of clinical pathology; 64 (11): 937- 946. 4. Yifau, W., and Binhua, P.Z (2011): Epithelial-mesenchymal transition in breast cancer progression and metastasis: Chinical journal of cancer; 30 (9): 603-611. 5. Viale, G (2012): The current state of breast cancer classification: Annual Oncology; 23(10):207-210. 6. Sotiriou, C., Neo, S.Y., McShane, L.M (2003): Breast cancer classification and prognosis based on gene expression profiles from a population-based study. Proclaimed National Academic Science; 100:10393–10398. 7. Hosoi, T. (2002): Polymorphisms of vitamin D receptor gene. .Nippon Rinsho. 60Suppl 3: 106–110. 8. Uitterlinden AG, Fang Y, Van Meurs JB, Pols HA, Van Leeuwen JP (2004): “Genetics and biology of vitamin D receptor polymorphisms”. Gene 338 (2): 143–156. 9. Norman A.W. (2007).”Minireview: vitamin D receptor: new assignments for an already busy receptor”.Endocrinology147 (12): 5542–5548. 10. Bollag W.B. (2007): Differentiation of human keratinocytes requires the vitamin d receptor and its coactivators. Journal of Investigative Dermatology127(4): 748–750. 12. Rose A.A.N, Elser C, Ennis M. (2013): Blood levels of vitamin D and early stage breast cancer prognosis: a systematic review and meta-analysis. Breast Cancer Resilience Treatment; 141:331-339. 13. Wang, D., Velez de-la-Paz OI, and Zhai JX, (2013): Serum 25-hydroxyvitamin D and breast cancer risk: a meta-analysis of prospective studies. Tumor Biology; 1-9. 17. Friedrich M, Villena-Heinsen C, Tilgen W, Schmidt W, Reichrat J, Axt-Fliedner R. (2002): Vitamin D receptor (VDR) expression is not a prognostic factor in breast cancer. Anticancer Research May-Jun; 22(3):1919-1924. 19. Al-Azhri J, Zhang Y, Bshara W, Zirpoli G, McCann SE, Khoury T, Morrison CD, Edge SB, Ambrosone CB, Yao S(2017): Tumor Expression of Vitamin D Receptor and Breast Cancer Histopathological Characteristics and Prognosis. Clin Cancer Res.23(1):97-103.